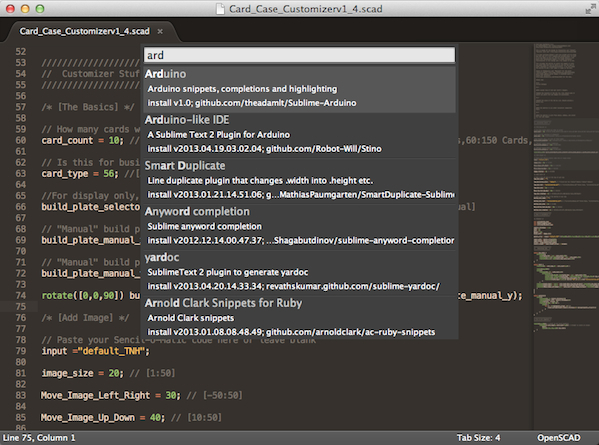 The New Hobbyist Shares His OpenSCAD Setup, Using Sublime Text Editor #3dthursday « Adafruit Industries – Makers, hackers, artists, designers and engineers! I just recently started using Sublime Text 2 as my primary editor and I’ve got to say it’s really a great addition to my work flow. Not only does it have a clean look and all the features you would expect from a modern editor, but it also has some pretty crazy stuff like a built in package manager! With just a few keystrokes you can search to see if you have syntax highlighting for a particular language installed, pull up the package manager, and install it. All in a matter of seconds. It’s pretty awesome. One of the nice things about this editor is that it’s cross platform. Last I checked it works on Windows, Mac, and Linux, there are also portable binaries for Windows (pretty handy for on the go coding). It’s always nice to be able to work in a program you’re familiar with regardless of platform, since I often switch between my Windows desktop and Mac laptop this is a big plus for me. If you’re new to the editor, I’d recommend watching this excellent Sublime Text 2 tutorial series by the genius programmer and trainer Jeffrey Way. The tutorial starts at the basics and goes all the way through to advanced and complex workflows. I learned a lot from this series and would recommend it to anyone looking to pickup some new skills. 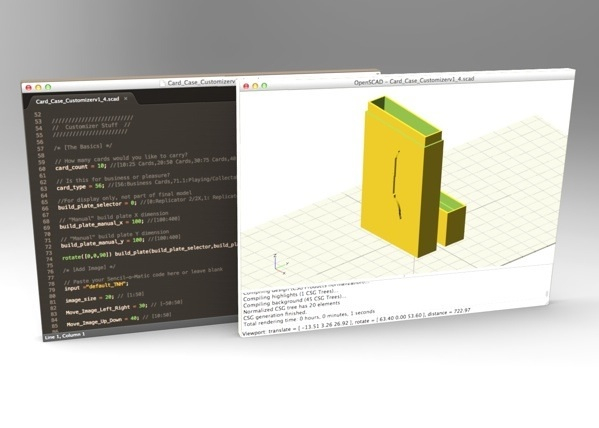 To augment the editor I’m using a modified version of Tony Buser’s “OpenSCAD Customizer Textmate/Sublime 2 Bundle” that includes code snippets for the Makerbot Customizer app. This adds syntax highlighting and code snippets for the OpenSCAD language which are not included by default in Sublime Text. All the credit goes to Tony on this one, he did a great job setting up the original package, I just added a few things that have changed since he wrote it…. Read more about his setup, including his list of added bundles/plugins here.